Note: In order to play the game using VCMI engine you need to own data files for Heroes of Might and Magic III: The Shadow of Death. VCMI is an open-source project released under the GNU General Public License version 2 or later. If you want help, please check our forums, bug tracker or github page. 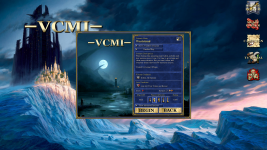 You can download VCMI 0.99 for Windows on official website. For Linux see wiki page. We also have daily builds for Windows up and running. We recommend you first make a copy of clean Heroes Complete / Shadow of Death folder. Extract VCMI zip package there. WoG is not needed. All recommended mods and files can be downloaded via Launcher included in the package. Also welcome our latest contributors Dydzio and Chocimier. I'm interested in maybe helping out, if i can. Primarily with the Windows version and multi-threading. Will there be any more updates to the Android port of VCMI? The version currently present on Google Play is 0.97. Please make VCMI compatible with Windows XP (in v0.99 VCMI_launcher.exe shows the message that it's not a Win32 application). Hmm, I tried latest daily build and it doesn't have this problem. It's probably a compiling issue of initial v0.99. Unfortunately our numbered releases built with Visual Studio and there is some problem with XP compatibility when building Qt application. Daily builds for Windows are created via cross-compilation from Linux using MXE (MinGW / GCC) so they don't have same problem. We keep save compatibility very carefully for almost two years so you can safely play daily builds without worrying about that. Most likely saves will be compatible for long time until there appear some very serious reason to break them.